March 2012 saw a selection of Cape Town’s electronic music scene come together in celebration of its existence. Through a series of development workshops, Satellite events and a core 3 day festival the process of presenting an annual look into the multi facets of South Africa’s electronic music scene had begun. Once again we reach back to the roots of how it all started, and discover what continues to inspire. Who has progressed and why and who are the names to watch. Which global artists shape trends in South Africa and more importantly who are the South African artists that are shaping trends globally. 2013 sees CTEMF proudly welcoming its first International guest, non other than Richie Hawtin. As one of the initial role players in the global Techno movement in early 90’s, he has continued to be a driving force both on and off stage, positioning him currently as number 2 Artist in Resident Advisor’s 2012 DJ poll. Locally, CTEMF will once again present a selection of the absolute cream of the crop of our Electronic Music Scene. From scene originators and business leaders to the up & coming mavericks and industry revolutionaries. There is no other festival like it in South Africa. It’s an ongoing, comprehensive collection and celebration of the ever-growing electronic music scene both locally and abroad. The CTEMF continues to strive for an inclusive view of the scene around it – Past, Present & Future. Once again you are invited to rearrange your sonic geography. Limited R200 early bird tickets on sale from 3 December 2012 to Wednesday, 16 January 2013 – All tickets available on Webtickets. 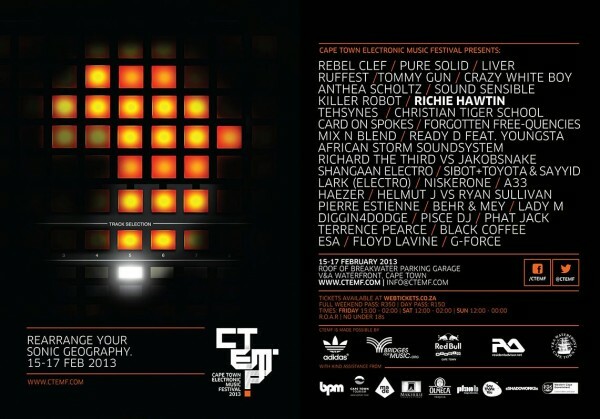 CTEMF 2013 – Ticket Giveaway!